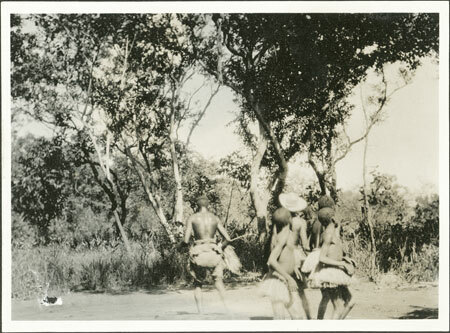 A group of boy circumcision initiates (agangasi) wearing grass fibre skirts performing a circumcision dance (gbere agangasi) with their sponsor (identifed as Yakobo) holding a spray of plant leaves. Notes on card mount m/s pencil - "SS (severe) RHS + Tear lower LHS"
Morton, Chris. "Zande circumcision initiates dancing" Southern Sudan Project (in development). 03 Jan. 2006. Pitt Rivers Museum. <http://southernsudan.prm.ox.ac.uk/details/1998.341.505.2/>.